One definitely has the feeling that the Disney producers of this 50th Anniversary DVD release were more than a little strapped for materiel to pad out the movie - which is as short as it is gorgeously visualized, and set to Tchaikovsky's lilting ballet music. 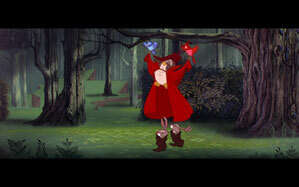 It is the ultimate dance move; it seems as if every character, not just the two lovers are dancing, most of the time. The video itself looks quite lovely, clean and crisp, and I am sure the enhanced `surround sound" would have rattled the rafters, if I had the home theater sound system... er... and any rafters to rattle. Even at the length of barely over an hour, the movie enchanted the public almost as much as its creators --Walt Disney himself not the least. 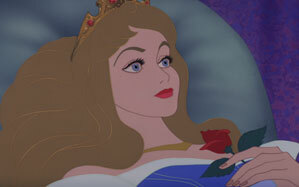 The castle in whose highest tower the lovely Aurora slept, waiting for true love's first kiss was being built for real even as "Sleeping Beauty" was in production, to eventually become the landmark and logo for Disney's real-world amusement park properties. One of the extra features is a walk through of an original feature of the castle, in which park visitors peeped through keyholes, windows and doors at various scenes. This feature is long-closed, but was re-created electronically, using some of the still-extant features, which seem to have been just left in the closed up storage spaces within the Castle. There is a very long feature about the "Making of" in which a shout-out is given to just about everyone (living and dead) who had anything to do with the creation of the feature. We half-expected inclusion of the janitors who swept up and emptied out the trash baskets, since this kind of animation must have meant tons of it. There is also the usual collection of discarded story-boarded but never animated scenes, an alternate opening... and the Disney short about Grand Canyon, set to Ferdy Grofe's music. Not sure what that was doing there, maybe for the classical music element. This is probably my favorite of the classic princess stories produced by Disney because Prince Philip is actually a character and doesn't just ride up at the end to sweep the girl off her feet. He has his own trials to get through before all ends happily ever after. This is a beautiful edition on blu-ray and the aspect ratio is a big part of that. It just looks more sweeping than prior editions. Color is spot-on throughout, and the audio is lovely. The fight with the dragon is gorgeous. I haven't had a chance to go through all the extras or the bd-live yet, but I hope to in the near future. I am also happy to have the standard DVD included so I can watch the movie on other DVD players or let relatives without blu-ray machines borrow it. I wish more blu-rays included this option instead of just digital copies. Brought me right back to the first time I saw it in NYC! 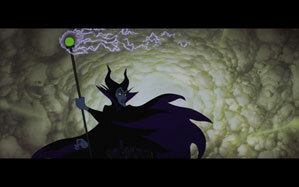 One of the best and my favorite Disney movies. 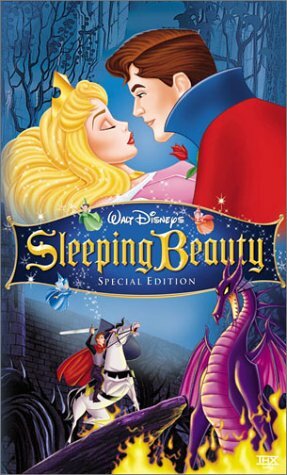 Disney's classic fairy tale SLEEPING BEAUTY is timeless. It is as lovely today as it was in 1959. 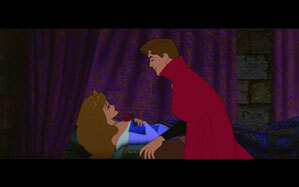 Full of warmth, saturated colors, and an enduring story, SLEEPING BEUATY continues to enchant princesses of all ages. We purchased this DVD for my three year old as a Christmas gift, but could not resist a sneak peak at Grandma and PawPaw's house over Thanksgiving. 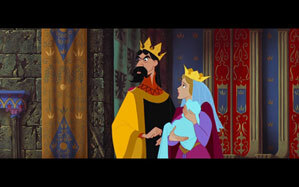 The animation was stellar in 1959, and I must say, it certainly holds its own against any animation of today. The vibrancy, detail, and charm still capture the imagination, submerging the viewer the fairy tale world. The story itself is eternal: good triumphs over evil and love, true love, concurs all. The music is a perfect accompaniment to the tale, and "Once Upon A Dream" ranks up there as one of the all time best Disney songs. I very much enjoyed watching this with my two girls and the rest of my family. It was a beautiful way for the entire family to spend a small part of Thanksgiving week doing something memorable together. I was surprised about how much of this movie I did not remember from when I saw it 40 years ago, and I was surprised how much detail my 11 year old remembered from the first time she saw it. 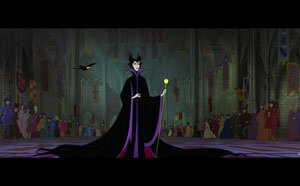 The three year old was simply enchanted by the entire movie; from the fairies to Princess Aurora. She was enraptured the magic and the majesty of the story. I highly recommend this dvd as a treat for the entire family. Little ones, teens, parents, grandparents, aunts, and uncles will all have a wonderful time together. It will make your time together a little happier and a little brighter. And that is what memories are all about. I rented the remastered standard edition dvd a while back and was not impressed while watching with my six year old daughter. In fact, I was probably catching up on something else when it was playing. After I popped in this blu-ray addition, wow! 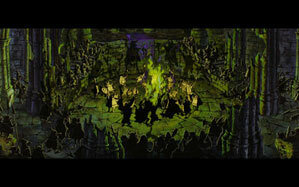 The colors and detail, especially the background images were amazing which made the overall movie more enjoyable. This is probably how people felt when it was released in the theaters. Every scene just made me want to grab a screen shot and make it my wallpaper on my computer or something. The sound was great in that the musical score didn't sound monotone and dated like these movies often due. While it supports 7.1, the surrounds weren't really engaged. My left surround seemed louder than the rest which made me think I needed to calibrate my receiver or it could have been the movie itself. The only flaws in the movie itself was the fact that the fairies didn't know how to make a cake or dress after taking care of Aurora for 16 years? Also the prince got way too much help from the fairies in my opinion. Will be using that as a lesson somehow for my daughter in the future. Don't count on no prince charming, etc. First the bad...the front of the package says "LIMITED TIME ONLY" Includes bothe 2 disc blu-ray and 1 disc DVD. OK so I open the package and I see two blu-ray discs, but no DVD. Not a big deal as we are a home theater family, but it would have been nice to send the DVD to a neice or nephew. That being said I must insert another con....too many Previews and In Theaters now at the beginning of the movie. Almost ridiculous, thank goodness for the PS3 skip feature. Finally the movie....oh man the movie. I saw this as a child back in the mid 80's as a re-release in theaters, and thought it was pretty amazing then, but on a Home Theater 96 inch screen, with full surround sound (which is fantastic in DTS BTW) set at a humble 720P was almost geek heaven. The clarity was amazing, the colors were amazing, it was like getting a new book that was done by a master painter, and it was if you watch the movie with the commentary on. Absolutely worth it IMO!